At GoJumps, our goal is to provide you with a SAFE and fun experience using our moon bounces. 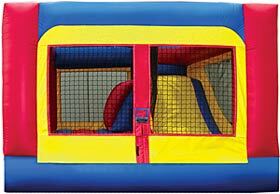 However, moon bounces are not made to be used in rain or adverse weather conditions. Rain causes the moon bounce to become slippery. Because of the static electricity properties of the material, lightening has been known to be attracted to the vinyl of the moon bounce. High winds can cause a moon bounce to flip over or take flight. We will do all we can to help you have a fun-filled, safe event. Keep in mind that as a matter of public safety and insurance policy, GoJumps will not set up a moon bounce in unsafe weather conditions. There are many great alternatives if there is rain forecasted on the day of your event. If you have a large room such as a basement or garage, we can set up one of our Indoor Combos in your home. We also highly recommend renting a community center or school gym during cold winter months. Many communities have buildings or rooms for rent for a small fee. We would be happy to refer you to a local community center that has accomodated one of our units in the past. If you would like to reschedule do to rain, we will do all in our power to get you the moon bounce that you want on a date that works for you. CANCELLATION: You are welcome to cancel for any reason, including adverse weather conditions, up until 7 a.m. the morning of your event. There is no fee for cancellation if done by this time. If you cancel after 7 a.m., you will be responsible for a minimum $50 cancellation fee. GoJumps/Leaps and Bounds will NOT set up a moon bounce outdoors in the rain and reserves the right to cancel parties as a matter of public safety.